For as long our Sun has existed, sunlight has been Earth’s primary source of energy. Without our Sun all life on Earth will cease to exist, we simply cannot live without the Solar Energy. Regardless of people thinking of Solar as a new way of Power for our civilization, solar Energy it’s been all around us since before the beginnings of our own existence, and Harnessing power from the sun has been dated back to ancient civilizations. It’s been during the last decade that Solar Energy implementation has been taking off, and in the state of Nevada, it’s becoming a common ground for the production of clean energy. To put things into perspective, let’s just talk about the biggest Solar Power Plant in Nevada, and maybe the USA. Nevada Solar One, is the Super Solar Power Plant for Nevada, is a solar thermal plant with a 64 MW generating capacity, this super solar power plant in the Mojave desert went online for commercial use on June 27, 2007, it was constructed over a period of 16 months. It is the second solar thermal energy (STE) power plant built in the United States in more than 16 years and the largest STE plant built in the world since 1991. It is located in El dorado Valley in the southwest fringe of Boulder City, Nevada. The total project site is approximately 400 acres (0.6 mi² / 1.6 km²), while the solar collectors cover 300 acres (1.2 km2). 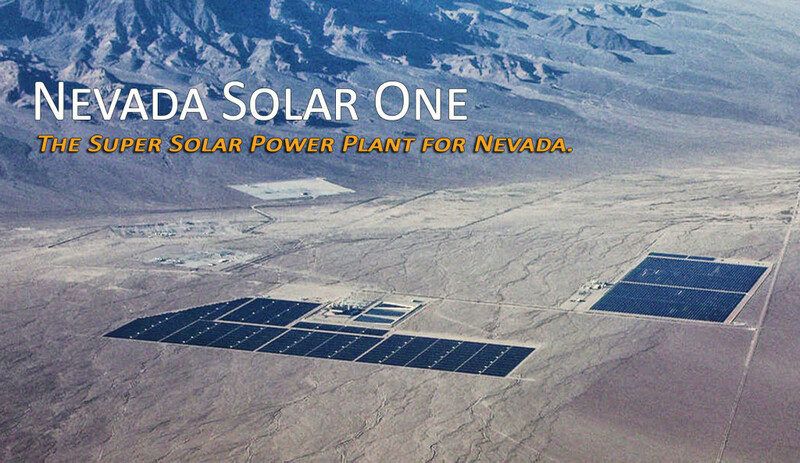 Nevada Solar One is a concentrated solar power plant, supply power to the electric grid with a nominal capacity of 64 MW and maximum steam turbine power output up to 72 MW net (75 MW gross), spread over an area of 400 acres (160 ha). The projected CO2 emissions avoided is equivalent to taking approximately 20,000 cars off the road annually. Electricity production is estimated to be 134 million kilowatt hours per year. This Super Power Plant, Nevada Solar One uses proprietary technology to track the sun’s location at different times during the day, and this way maximizes the power collection at every hour. The plant uses 760 parabolic trough concentrators with more than 182,000 mirrors that concentrate the sun’s rays onto more than 18,240 receiver tubes placed at the focal axis of the troughs and containing a heat transfer fluid (solar receivers). Fluid that heats up to 735 °F (391 °C) flows through these tubes and is used to produce steam that drives a Siemens SST-700 steam turbine, adapted to the specific requirements of the CSP technology, which is connected to a generator to produce electricity. Solar thermal power plants designed for solar-only generation are well matched to summer noon peak loads in areas with significant cooling demands, such as the southwestern United States. Using thermal energy storage systems, solar thermal operating periods can be extended to meet base load needs. Given Nevada’s land and sun resources the state has the theoretical ability to have more than 600 GW of electrical generation capacity using solar thermal concentrators like those used by Nevada Solar One. The southwestern United States is one of the world’s best areas for insolation, and the Mojave Desert receives up to twice the sunlight received in other regions of the country. This abundance of solar energy makes solar power plants a cleaner alternative to traditional power plants, which burn fossil fuels such as oil and coal. Solar power stations provide an environmentally benign source of energy, produce virtually no emissions, and consume no fuel other than sunlight. It has been proposed that massive expansion of solar plants such as Nevada Solar One has the potential to provide sufficient electricity to power the entire United States. Environmentalist groups are currently encouraging more distributed generation of Solar Energy thru different programs such as rooftop solar which is gaining a tremendous momentum all over Nevada. With a Roof top Solar energy program, better Known as PPA (Power Purchase Agreement)homeowners are able to get a free customized and installed residential solar system in their homes at no cost, paying only for the energy this solar panels produce at a cheaper rate than the ones NV energy charges, allowing homeowners to save up to 30% in their electric bill and helping the environment at the same time. Get your Free solar Panels! This entry was posted in Nevada Power Plant, Solar Power and tagged Solar Energy, Solar Power Plants.